Last Thursday striking Remploy members closed production down for a second day of industrial action at factories threatened with closure across the country. In Barking the sun shone, music played and passing cars, lorries and buses hooted. The workers were joined in solidarity by their families, union members, and disability activists. Paul was in fine voice as he led the chants of Maria Miller Factor Killer and “What do we want? Jobs! When do we want them? Now!” A waste collector asked “Are you striking every Thursday now?” before adding “No worries, I’ll come back tomorrow”. For all the positive, supportive mood on the Barking picket line, workers and their families are deeply upset by the proposed date of closure of 18th August. They feel especially aggrieved at the way their voices have been ignored, by disability organisations supporting the closures, by government ministers and MPS who have failed to respond to the numerous letters written by the workers and their families and by the shambolic nature of the flawed and inaccessible 90 day consultation. Paul, was keen to share his experiences of working for Remploy, first at the Woolwich factory which closed in 2008 and then at Barking. Instead of going on terms and conditions as other Woolwich workers chose, Paul wanted to keep working and was transferred to the Barking factory, enduring a two and a half hour journey through rush hour each way each day until he was eventually able to relocate housing nearer his workplace. Paul still carries a photo of the Woolwich factory on his mobile phone. He feels that having lost Woolwich, losing Barking as well with no other job to go to will be unbearable. Cathy Collins, mother of one of the workers, spoke about rising levels of disability hate crime in the area. Her other son works for a local leisure centre and is frequently the victim of abuse and harassment from members of the public accessing his workplace. During a recent incident a man known to Cathy’s family who happened to be in the leisure centre intervened as two young men verbally taunted the son with the outcome that the man trying to protect her son ended up being arrested. Cathy’s letters to Iain Duncan Smith about the value of the Remploy factories have been ignored. Unfortunately for all the concerns voiced by the Remploy workers and their families and for all the public support these have elicited, the Government are still determined to pursue their decision to close 27 of the 54 factories before December making thousands of disabled workers jobless. Let us go at our own pace. 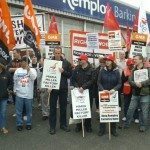 From Barking to to Bridgend and from Derbyshire to Dundee, up and down the country Remploy workers walked-out on strike together in defiance of Tory plans throw them on the scrapheap. Last week, the Minister for Disabled People, Maria “Factory Killer” Miller announced the closure of 27 of the 54 Remploy factories meaning the sacking of more than 1,200 mainly disabled workers. The outrage at this callous Tory decision was not only reflected in the solid strikes, the first of two 24-hour stoppages (the next being next Thursday 26th July), but also in the solidarity from other workers on display at each picket line. Teachers, council staff , IT workers, construction workers, students and more brought banners and collections to the picket-lines. Postal workers and lorry-drivers refused to cross picket lines. 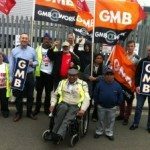 The stand taken by Unite and GMB members at Remploy is an example to the whole trade union movement about how to fight job losses. Work and Pensions minister Iain Duncan Smith says that he says that he wants to get disabled workers into mainstream employment or “proper jobs”. But millions can see through the Tories – they know that with more than 2.5 million unemployed and disability benefits being slashed, the standard of living for many Remploy workers will be immeasurably damaged, should their factories close. Since the last wave of Remploy factory closures in 2008, 85% of those made redundant have not worked since, and 95% of those that found employment were on less pay. Today’s marvellous show of solidarity was a step towards winning the battle for jobs. Next week the picket-lines need to be bigger and a strategy implemented for forcing another Tory U-turn and saving the factories. At the Barking factory in East London more than seventy workers, their families and supporters came to support the picket throughout the day. Just one day earlier the factory workers had learned that the date they have been given for closure is 30th September. Although shocked and upset the strike day was a chance to rally round and rebuild confidence and spirits. Every hoot from passing buses, lorries and cars was met with a cheer while deliveries and post were turned away. Paul, who has worked at the factory for the past 21 years and who prior to that had turned to street drinking as a consequence of a period of unemployment, led the chants of “Maria Miller Factory Killer”. George Barratt, independent councillor for Barking and Dagenham, spoke to workers and expressed his support in the fight to keep the factories open. Solidarity also came from further away with a group of Unite workers hailing from as far afield as Rochester on a nearby course joining the picket in their lunch hour. One of the union reps commented that when he worked for the Ministry of Defence all the best quality manufacturing came from Remploy factories. Messages of solidarity and support were read out from disabled people and union members across the country. Mark Holloway, GMB rep for the Barking factory expressed thanks to everyone who took part, He said he had only expected “three men and a dog” to turn up and was completely blown away by the level of support. 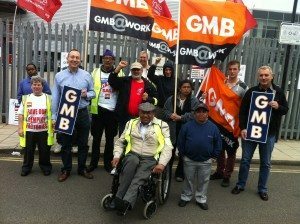 A DOZEN striking workers gathered outside Remploy Acton on Thursday. They were joined by local trade unionists from Ealing council, as well as by John McDonnell MP. The workers argued that their factory is profit-making, and produces vital equipment, such as fire-safe clothing for the fire brigades. They made the point that they are skilled workers, and that the closure of their factory would mean the loss of their skills, as well as the destruction of the community they have built in their workplace. The government has announced their decision to close Remploy factories, set up after the war to provide real jobs for disabled people. 27 factories across the country including the one in Barking are set to close before December. This decision will leave thousands of disabled workers without income. Following an earlier round of factory closures in 2008 disabled workers left without jobs ended up suicidal and ill with only 5% going on to find alternative work. We must not let this happen to disabled workers in Barking. Disabled People Against Cuts is a campaign led by and for disabled people, campaigning against the Condem government’s vicious attacks on disabled people that risk pushing our rights back decades. John McDonnell MP speaking in the House of Commons in June about the Remploy closures warned the government that our campaign is strong and that disabled people will not go away. We say we will not give up the fight and let thousands of workers be thrown on the scrapheap. We believe we can win this if we unite in support of the Remploy workers.